"Where Are Our Angels Now?" August 7, 2010 was a memorable day for my family –to say the least. The two pictures above mark the extremes that we experienced in that twenty-four-hour period. Elated then worried. Invigorated and victorious. Then exhausted and helpless. 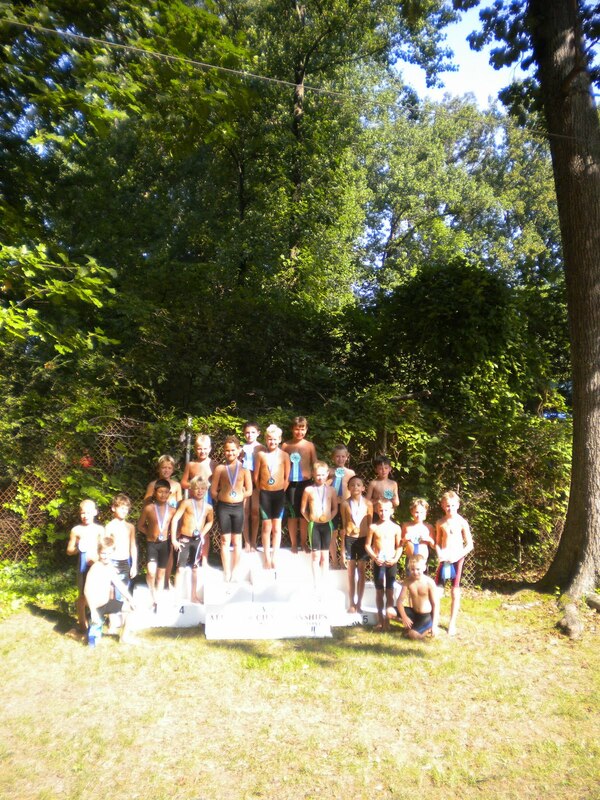 Since 8 and under boys’ backstroke was the first event at the All-Star meet for the Northern Virginia Swim League, by 9:15 a.m. on August 7th my oldest son Will was a champion. He had dreamed about this moment, worked hard for this moment, and swam his heart out for it. And I’m not sure Mrs. Phelps has ever been more proud than I was that morning. Will swam again that afternoon, placing fourth in the freestyle out of the eighteen all-stars. That race marked the end of an amazing season, but we had no intentions of just relishing the accomplishment and the downtime. No, instead our reservations at Maranatha were set to begin that night. My husband was working overnight that Saturday and Sunday and would fly to Michigan on Monday. So when we got home from the swim meet, I packed up the minivan with bikes and scooters and boogie boards and more clothes and towels and food than we needed. The boys crammed into the bench seat, and about six p.m. with the minivan chock full, we set off for Michigan. There would be no way that I could possibly drive the almost 700 miles that night. But I figured we’d get as far as we could. This kind of play-it-by-ear planning is so not my husband’s modus operandi, but he knew how excited the boys were to get there so he bid us adieu with lots of kisses and “be careful”s. And the trip went quite well. The radio in my minivan was broken and I had not had a minute to get it fixed. Plus, we were debating about getting a new car anyway. So we used iPods and my iPhone for entertainment, and really Sammy is just like a traveling comedy act so we talked and laughed and made our way through Maryland and Pennsylvania. But as we neared Ohio the boys started to drift off, and an eerie silence and pitch blackness took over. I might be forever spooked by Eastern Ohio at night. I had to be careful about not using my iPhone too much because I had no way of charging it. It was almost midnight and a few miles into Ohio, and I knew it was time to stop. So I started looking at signs and calling a few places. “Booked up,” I heard. Booked. Booked. “Ma’am, there’s nothing until Cleveland because of the U.S. Open and blah blah blah.” So I started feeling kind of anxious, and yet my eyes were tired and strained, like I just needed to close them for a couple of minutes. I called Will at work. I was tremendously proud of him that he didn’t say anything like, “See, this is why I don’t do things like this.” Because I know him, and I know he wanted to. So I sat in the car with my eyes closed, and Will called around for us from work. The verdict: nothing in Ohio until past Sandusky. But that would be impossible. I just couldn’t do it. Too dark. Too quiet. And now I was way too anxious. 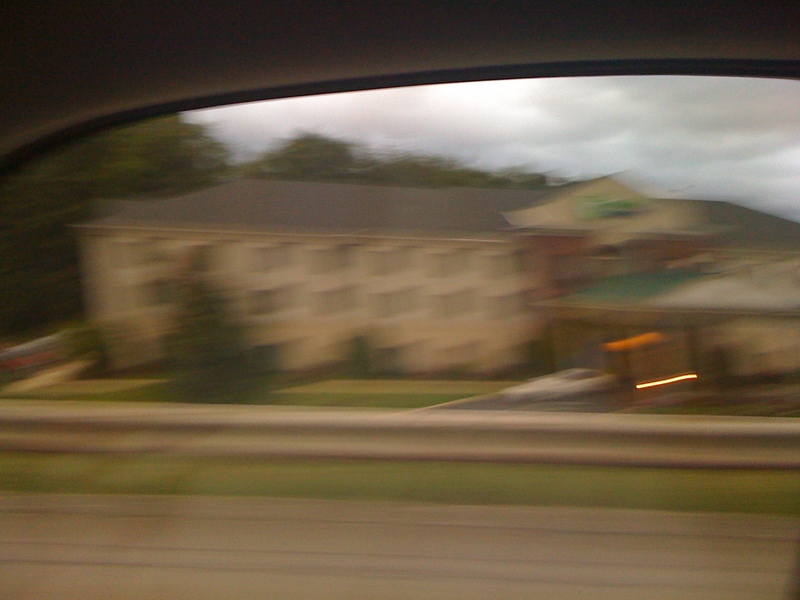 So that’s how we ended up staying the night in the Holiday Inn Express parking lot pictured above. Those five hours were intense and interesting, and the difference in personalities was magnified. Nate was willing to roll with it. Shockingly, he was almost selfless. He accepted that this was something of a crisis and he did not air a single complaint. Sam was restless and feisty because he’d already slept for hours. He could not get comfortable no matter how we arranged ourselves. And poor, darling Dub, it was hardest for him. He was the only one who cried, and he yelled out things like, “We are never getting out of here!” and “Where are our angels now?” It really makes me laugh to think about it. And even then we had these inexplicable bouts of hysterical laughter. Someone would start laughing and we’d all join in. It was the strangest thing. And Dub, sweet and tender, Dub would go from uproarious laughter to tears and back again. No one slept for an hour or two, because there was this heavy and profound feeling that was just incongruent with sleep. So we talked about God and how we had prayed with Daddy for protection before we left. We talked through questions like were we safe? Did God hear our prayer? Were our angels there? Was God in control or not? I told them that the Bible tells us to pray, but that the Bible also proclaims God’s sovereignty. If we think God is like a genie, we will be disappointed. If we think we can produce a certain result by following a certain formula, we will be disappointed. No, God doesn’t want us to be captives of our circumstances, letting our trust ebb and flow with situations we deem good or bad. Instead, He wants us to trust Him in times of victory like that morning, and trust Him in times that are less comfortable, like that night. Our trust, our faith, our love — none of these should be circumstantial. Although I certainly don’t intend to set out on another road trip like that one, I do hope and pray that my boys learned to trust God a little more that night. Because I really want to raise three little Davids who can authentically echo the Psalms saying, “Trust in him at all times, O people; pour out your heart before him.” (Psalm 62:8). So whatever comes your way this week, whatever comes my way this week, may we trust Him through it all. I just now read this and tears sprung to my eyes. Thinking of sweet Dub swinging between tears and laughter just gets my heart! Oh, Krist, the way your life is orchestrated… so Divine. As always, thank you for sharing. You bless me tremendously with your words!